The 1100 is the first pen produced by Benchmade a company that is famous for its cutting instruments. The 1100 is a tactical metal pen intended to double as a writing intrument and self defense tool. 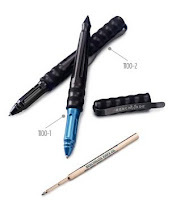 The pen is made of anodized aluminum in charcoal black or a combination of black and blue. The finish is non-reflective which is good for tactical applications. The writing tip is in one and and a pointed kubaton style is at the other. The pen closes with a charcoal black cap that can be used to cover either the writing tip or the kubaton end when you are writing. In the cap there is a stainless steel pocket clip that can be removed in case of need. The pen writes using a fisher space pen refill, the ink is pressurized so it can write upside down, under water, over greasy surfaces, at high altitudes, etc. The grip is very confortable and the pen is heavy but well balanced for writing. We have the feeling that it will be a little too heavy for very long sessions of writing but who writes with a tactical pen for hours?. With the cap closed the kubaton has a good size, probably a little small for very big hands but perfectly grippable for normal hands. The tip is very very pointed and can certainly produce massive damage with only small force applied. The appeareance of the pen is intimidating, that is good for self-defense but is certainly a problem for airports and other locations with strong security measures, this pen looks as something that can be confiscated. The cap fits very well with an o-ring to seal the tip completely, it adjusts well to both the writing end or the kubaton end. The pocket clip is strong and has a good size, it maybe too strong for a shirt pocket but is very safe for a pants pocket. The 1100 is an expensive pen to be made in aluminum having a price similar to Titanium made pens or higher-end instruments. We have the feeling that it is an excellent combination of a pen and kubaton but it is not very discrete has a strong risk of confiscation and it is too expensive for what it is and what it does. You can read more and order for $120 from Benchmade. cotton 5.11 Tactical Pant comes in 11 colors,with size ranges to fit virtually everyone and With 100% cotton canvas.I think this Pants is so comfortable and functional,it has become an industry icon.